Not much time to write stuff tonight, but really is that what people want to see? I say "No", anybody can write stuff. What you want to see are rough scribbly and occasionally (often ?) crappy behind the scenes sketches and stuff. 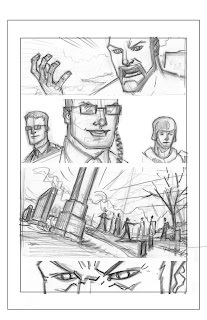 So here you be, some of the rough pencil pages for issue 13. Go! 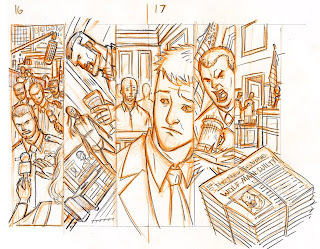 Note on page 1, panel 3 changed a bit on the final art. I like the scope of this panel, but Robert thought it might be better to zoom in so that we could actually SEE the characters. That Kirkman is a smart dude. Note that on this page a dude gets punched. These next 2 page spreads were some of the most fun things to draw for the whole issue. I just found your blog so wanted to thank you for drawing such a cool character and hope you will be around for a while. Please keep it up. 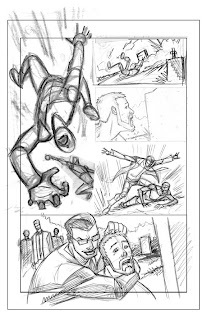 Loved the last issue pencils and cant wait to see what else you have waiting to show us. Wow, you call those "rough" pencils!? I'm guessing you use the same process to turn these into you final pages, such as scanning and enlarging, which you mentioned in your previous post? All your ough work is really great and informative, but i'd love to see you draw something on camera, speeded up... from start to finish. Seeing you draw something 'live' would be the ultimate behind the scenes! All you need is a camera and a Youtube account... oh yeah, probably editing software, a bit of spare time and the actual inclination to do it too. But anyways, i'd love to see it one day. 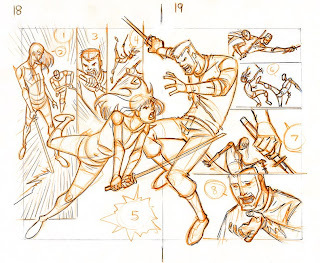 Once again, awesome rough pencils as always and thank you for sharing. Hey, deviant art and now a blog?!! I'm finding you all over the net now! I've been looking for you via the web. Even tried myspace. Good to see your new works!